CASRON CITY—Today’s doomsday prophets don’t stand on street corners with signs warning “The End is Nigh.” Instead, they hold hearings on the dangers of climate change. CARSON CITY—Today’s doomsday prophets don’t stand on street corners with signs warning “The End is Nigh.” Instead, they hold hearings on the dangers of climate change. Last week, Democrats highlighted several actions intended to fight what they believe is a looming climate catastrophe. On Tuesday, Gov. Steve Sisolak announced he had joined the U.S. Climate Alliance. That’s a group of governors who have committed their states to reducing greenhouse gas emissions by 26 percent below 2005 levels by 2025. That’s the goal of the non-binding Paris Accords, which President Donald Trump pulled the United States out of in 2017. 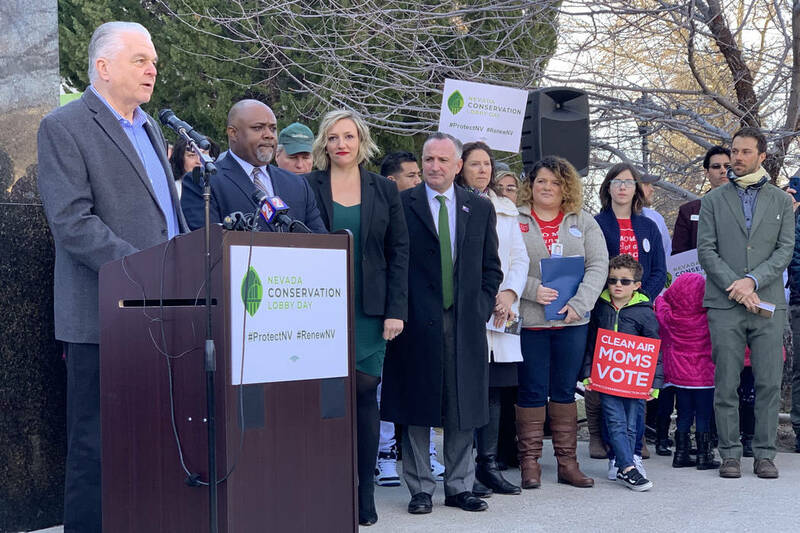 “With these ambitious goals and commitments to reduce our carbon footprint, I am determined to make Nevada part of the solution,” Sisolak said. Sisolak’s announcement sounds bold, but it’s not. Every four years, the Nevada Division of Environmental Protection estimates the amount of greenhouse gas Nevada generates. In 2005, Nevada produced 60.3 million metric tons of carbon dioxide equivalents. In 2013, the latest year data is available, Nevada produced 44 million metric tons. If you consider net emissions, that number falls to 39.3 million. So Sisolak has committed Nevada to do something it has already done. The biggest greenhouse gas reductions came from NV Energy moving from coal to natural gas power. You have to give Sisolak credit for a great political move. He can claim that Nevada has helped save the world from global warming without having to make any difficult decisions. If only that would satisfy the environmentalists. Instead, state Sen. Chris Brooks, D-Las Vegas, is pushing Senate Bill 254, which aims to eliminate Nevada’s greenhouse gas emissions. It requires the Department of Conservation and Natural Resources to produce policies and regulations that would reduce greenhouse gases by 45 percent below 2005 levels by 2030. The agency must determine if those policies meet the goal of zero emissions by 2050. Those benchmarks come from the United Nations’ 2018 Special Report on Global Warming. That study says the world needs zero net emissions by 2050 to limit global warming to 1.5 degrees Centigrade. Reducing greenhouse gas emissions to zero is code for destroying Nevada’s economy and your way of life. It would require eliminating air travel, coal and natural gas power production and gas-powered cars. It would also require killing all the farting cows, unless someone can produce an effective bovine diaper. Environmentalists assert these draconian steps are necessary to prevent a global catastrophe. What’s funny is that the U.N. report also objects to expanding nuclear power, which has no carbon emissions. How is the world ending a better scenario than more nuclear power? Even if you accept the U.N.’s projections, any actions taken by Nevada or even by the United States are practically meaningless. That’s because countries such as China and India are rapidly building coal power plants. In 2015, China released twice as much carbon as the United States. Its carbon output is on pace to increase by up to 100 percent between 2010 to 2030. India, which released half as much carbon as the United States in 2015, will likely triple its output over the same timeframe. The environmental lobby has been claiming for more than 50 years that an ecological doomsday is just a few years away. Instead of learning from their past mistakes, they’re seeking to ban planes, power plants and automobiles.